Shimla-Narkanda-Sarahan-Sangla-Chitkul-Kalpa-Nako-Tabo-Dhankar-Kaza-Key-Kibber-Chanderatal Lake-Keylong-Udaipur -Trilokinath-Manali and drive back to Chandigarh. Do you love actioning and looking for a tour at unbelievably low price If yes, then Himachal is the perfect destination for you. Kinner Kailash and Spiti Valley is a rejuvenating tour package of 13 Nights and 14 Days. The itinerary makes you travel through the tribal regions of Shimla, Sarahan, Sangla, Kalpa, Nako, Tabo, and Kibber. 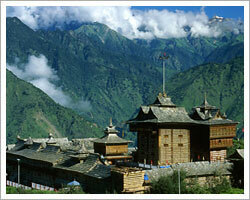 Adding zing to the tour, sightseeing to Manali is also included. It is a mesmerizing experience to get close with the tribal life of these regions and explore the exotic flora and fauna. One can enjoy and feel relaxed in the unspoiled beauty of the mountains and nature over here. The Mt. Kinner Kailash (6,050 metres) is regarded as one the mythological abodes of Lord Shiva, and you can have the magnificent view of the peak from Kalpa village in Kinnaur valley tour. This trip is possible from June to October only. Exact dates of opening of this route mostly depends on road condition at Kunzum La pass. An amazing hill station, Kaza is a chief town in the majestic Spiti valley. 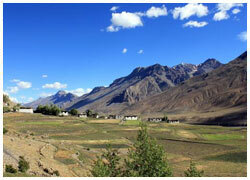 Spiti means middle land – between India and Tibet. The Spiti valley receives very little rainfall is bound on both sides by Lahaul and Kullu valley. Day 01	: Arrival at Chandigarh and drive to Shimla . 2,250 metres / 7,382 feet (120 kms /4 hrs). On your arrival at Chandigarh railway station / airport you will be met by our driver and he will drive you to Shimla ( 4 hrs) via Barog, Solan. Enroute you will stop for lunch break at Barog ( 2 hrs from Chandigarh) and comfort breaks and would have enough time to stop for photo breaks. You will reach Shimla in the evening and will transfer to your hotel in Shimla. Overnight stay in Hotel in Shimla. Evening is free to explore the mall road of Shimla. Day 02	: Shimla local sightseeing. 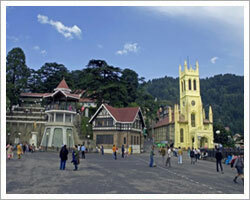 After breakfast at your hotel your driver will take you for a full day of sightseeing tour of Shimla town. We will visit the famous Viceregal Lodge, also known as the Indian Institute of Advance studies- where arrangements for the partition of India and Pakistan were worked out the Jakhoo temple (monkey temple) on the top of Jakhoo hills, and we will also take you to visit Kufri or Naldera where one can go for pony rides in the countryside’s. Later on after the lunch drive back to Shimla and walk around the Mall road of Shimla to visit the Christ Church, the Gaiety Theatre, Mall Road with its scandal point. Second night in the same hotel in Shimla. After breakfast at hotel we will set off at around 9:00A.M. Today it is a drive of 9-10 hrs, driving through the beautiful villages of Fagu, Theog, Matiana, Narkanda and Rampur. En route we will have many comfort breaks and will visit the Apple orchards and Hattu peak (3,400 metres/ 11,154 feet) at Narkanda, from where you can have a spectacular view of the mighty Central Himalayas and will also visit the traditional wodden carved temple of Godess Kali on the top. We will also stop by a small lake on the way to Hattu Peak. Later on we continue our drive to Sarahan via Rampur and enroute we will stop for lunch break and various picture breaks and comfort breaks.Sarahan – the tiny village offers the splendid views of Shrikhanda Mahadev Peak (5,155 metres). The major attraction in Sarahan is centuries-old Hindu temple of Godess Bhimakali. Steeped in legend, the temple complex is a resplendent example of hill architecture. Sarahan is also the gateway to Kinnaur valley.. Overnight stay in Hotel in Sarahan. (A day to have short comfortable walks around the area). This morning after breakfast we will be driving you to Chitkul ( 20 kms, total 1 hrs, each side – 3,450 metres / 11,318 feet.) which is the last village on Indian side on the Indo–Tibetan border. 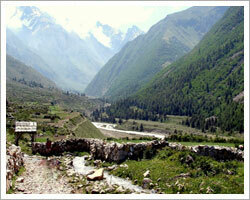 The village of Chitkul is like something from a fairy tale, and you will have a chance to walk slowly around it. The landscapes are stunning, and you will have plenty of time to enjoy them and talk to the local people. We will return to Sangla for lunch in the local restaurants and later the rest of the day is free to relax in the mountain landscape or if you like you can walk to another nearby villages or nature walk. We will have this second night at the same hotel / luxury tented accommodation at Sangla. Post breakfast get ready for excursion to Kamru fort. Saffron trees and cold snowmelt add elegant element to the aura. Explore this old fortress end enjoy the tranquility of the place. Later, proceed to Batseri village. Enjoy your stay at banjara camps/apple orchard farm and camping sangla valley , interact with the banjaras and be the part of their culture and tradition. Enjoy the hospitality extended by the inhabitants. Return to your guesthouse for an overnight stay. Day 07	: Sangla to Kalpa 2,758 metres / 9,048 feet (40 kms/ 2-3 hrs). After breakfast at the hotel you will be driven to Kalpa village (2-3 hrs.) Enroute we will stop at Recongpeo and will have a walk around the local market. Recongpeo is the district headquarters of Kinnaur district. We will have lunch in a local restaurant where you have a choice to enjoy Indian or Tibetian food. 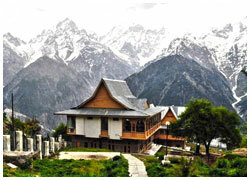 After lunch we will drive to kalpa ( 7 kms), you will check in to your hotel. 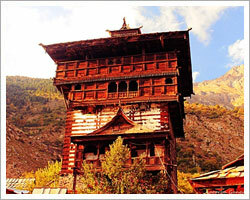 After some rest you may wish to take a walk to Kalpa village and the nearby Roghi village. These villages are covered with thick pine forests and are famous for apricots and apples. The finest view of the Mt. Kinner Kailash Mountain (6000 metres) can be had from here. This is a spectacular sight early in the morning as the rising sun touches the snowy peaks with crimson and gold light. After breakfast we will drive you to Nako (5-6 hrs.). Here you will check in to the hotel or in the luxury tented accommodation. Later on after lunch we will take you for a walk in the village with your guide and visit the buddhist monastery related to guru Padmasambhava (a great buddhist scholar, whose teachings spread to Tibet from India), we will also visit Nako Lake, the residence of His Holiness The Dalai Lama ji. Later on next morning you may wish to walk to the nearby peaks with your guide and enjoy a wonderful view of the whole Nako village with the Himalayas as the backdrop of the village. Day 09	: Nako to Tabo 3,894 metres / 12,784 feet , ( 90 kms / 5- 6 hrs). After breakfast we will drive you to Tabo (4hrs.) and en route visit the Gue village which is also the last Indian village on Indo-Tibetan boarder. Here we will be visiting the naturally preserved mummy of a Buddhist monk which is about 600 years old, which was discovered here while building the road. Later on reach Tabo and check in to your hotel. In the evening visit the Tabo monastery which is the oldest monastery in the Himalayas. Today we will be entering the beautiful Spiti valley which is also known as the cold desert of the Himalayas (this area is cut from rest of the world due to heavy snow in the winters). Proceed to Kibber early in the morning. Experience the natural bliss in the environment. Visit the monastery and communicate with the inhabitants. Hospitality extended by the locals is stupendous. Later, you may visit the Kibber Wildlife Sanctuary and explore the rich fauna and flora of the place. Return to your guesthouse for an overnight stay. This day is completely free for leisure at Kibber. Start your day with visiting Ki Monastery. Later, you can explore the region and enjoy the exotic flora and fauna of the place. This picturesque location is ideal to serve the rejuvenating experience. Communicate with the locals and enjoy the hospitality extended by them. Thereafter, return to your guesthouse for a nightlong stay. Early morning, drive to Manali. Reach your hotel, check-in and take a little rest. Later, you may spend the day your hotel or take gradual walks down the streets of Manali. Taste the scrumptious street food, communicate with the locals, etc. Return to your hotel for nightlong halt. Day 13	: Manali Sight seeing around Manali. Today you will make a late start after a leisurely breakfast. We will visit Old Manali village, Hadimba Devi temple and Vashist village (with hot water springs) with your guide. Later on we will take you to visit the nagger village and castle. Naggar Naggar was the ancient seat of the ruler of Kullu Valley and now the Naggar Castle is run as a Heritage hotel and Resturant Property by the tourism department of Himachal. We will visit the Naggar castle and will have a cup of tea or lunch here, before we drive back to Manali. In the evening you are free to explore the Manali market and shops and to finish with your final shopping. Day 14	: Manali - Chandigarh ( 290 kms – 11 hrs). Early morning, check-out from the hotel, and you will be assisted and transferred to Chandigarh Airport / Railway station. Reaching Chandigarh, you can continue your journey to onward destination.